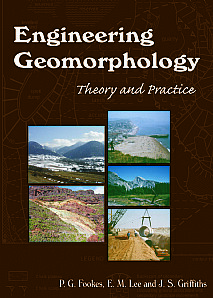 This significant new book by foremost experts in the field will be the first that truly covers the topic of engineering geomorphology as a distinct discipline and, as such, will be of paramount importance to both practitioners and students. Engineering geomorphology is concerned with the evaluation of landform changes, especially the effects of construction on the environment, notably on the operation of surface processes and the risks from surface processes, whether current processes or the legacies of past processes. Engineering geomorphology provides practical support for engineering decision-making (project planning, investigation, design and construction) and engineering geomorphologists form an integrate part of the engineering or environmental team. Engineering geomorphology has developed in the last few decades to support a number of distinct areas of engineering, including river engineering, coastal engineering, and geotechnical engineering, where engineering geomorphology has complemented engineering geology and has proven to be valuable, especially for rapid site reconnaissance and slope stability studies. Geomorphology provides a spatial context for developing site models and explaining the distribution and characteristics of particular ground-related problems (e.g. landslides, permafrost or the presence of aggressive soils) and resources (e.g. sand and gravel). Engineering geomorphology can also be applied to agricultural engineering, primarily in the investigation and management of soil erosion problems. This book includes basic concepts that underpin efforts to explain the causes, mechanisms and consequences of landform change. It then considers how the land surface works in the context of wetland, flatland, hills, mountains, rivers and coasts; and the techniques that are available to the engineering geomorphologist in the field, in the laboratory, in the office and in the various forms of remote sensing. Each succinct chapter is packed with vital information, well-illustrated with diagrams and tables and fully referenced so that the detail of subject matter can be followed up. Civil engineers, applied geomorphology practitioners and environmentalists; advanced undergraduates and postgraduates of geomorphology, geology and civil engineering.